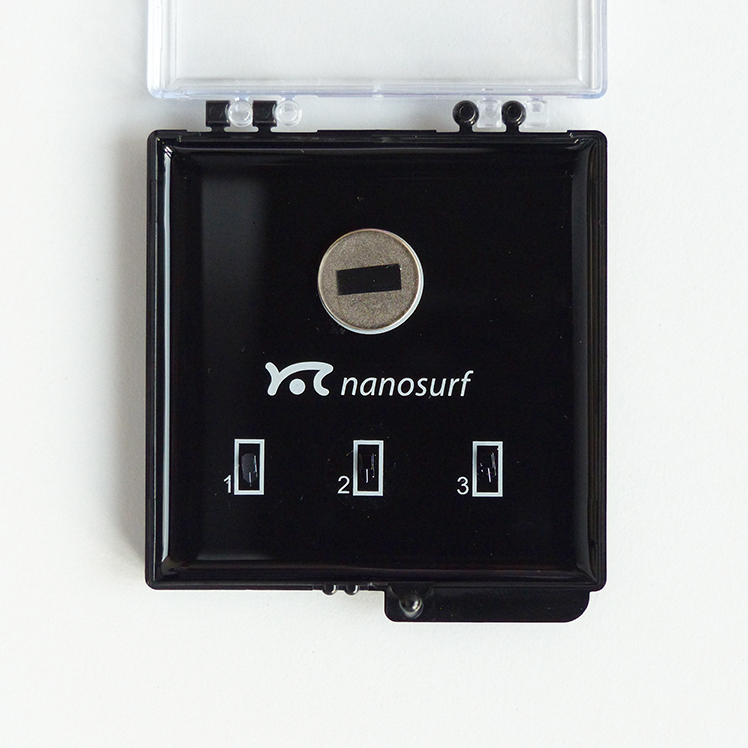 The Nanosurf standard MFM kit provides a piece of magnetic storage tape, 3 MFM cantilevers and a magnet to magnetize the cantilevers. All Nanosurf product lines that have dynamic phase imaging mode enabled can measure the phase response of the cantilever oscillation while being moved over the sample at constant height. The MFM signal can be recorded in different imaging modes. In intermittent imaging mode the topography is measured in the forward scan direction and MFM in the backward scan. In dual scan mode the topography is measured both ways along a scan line, after which it is repeated to record the MFM signal. Finally it is possible to record MFM without measuring topography before. For contour following during MFM experiments an advanced imaging mode (C3000) or advanced MFM option (CoreAFM) is available separately. Digital backup tape with magnetically stored data, as revealed by MFM. Scan size 50 μm.